Free-standing bathtub in stone, obtained from a single excavated solid, plug included. Free-standing bathtub in natural stone, obtained from a single excavated solid, plug included. Barcelona 2 follows the same design aesthetic as the popular Barcelona bath, but with more compact dimensions. The bath also features a void space underneath for waste plumbing. 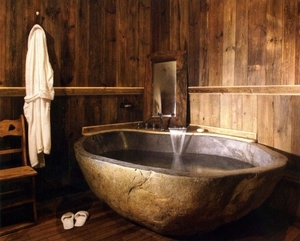 A stone bathtub may be preferred to standard alternatives for its luxurious natural appearance, its heat-retaining properties, durability and original finish. On ArchiExpo, these tubs arranged by type of stone or shape. Natural stone lasts longer than other materials if properly cared for. On the other hand, the resins and other synthetics in engineered or composite stone facilitate care, reduce wall thickness and weight, and increase resistance to chemicals and staining. Ensure that the tub shape is appropriate for the available space and offers user comfort. Rectangular units may be better suited to corner or wall installation. Organic and free-standing types can constitute a luxurious centerpiece in a spacious bathroom. Consider maintenance requirements. Stone baths with protective coatings may be easier to maintain than others. Some models may need to be cleaned with special solutions to avoid damage or staining.